The raillayer; must have, if you want to play with railway. Xterminator wrote: This looks awesome! I will definitely be using it in my current play through. 1. For the auto placing of signals, how does it know when/where to place them so that they are actually useful? 2. In the GUI, what does the setting for "weight of curved rail" do? Choumiko wrote: distance influences the amount of rail pieces (curved or straight) between each signal. Hope this answers your question, it does not check if the signal makes sense or not, it simply counts upwards and places a signal. That's it, simply counting, placing, not caring if it makes sense or not. Automatic signal placing is mainly intended for long long one way tracks without junctions. It should be fixed with the new version. At least you should not get an error. 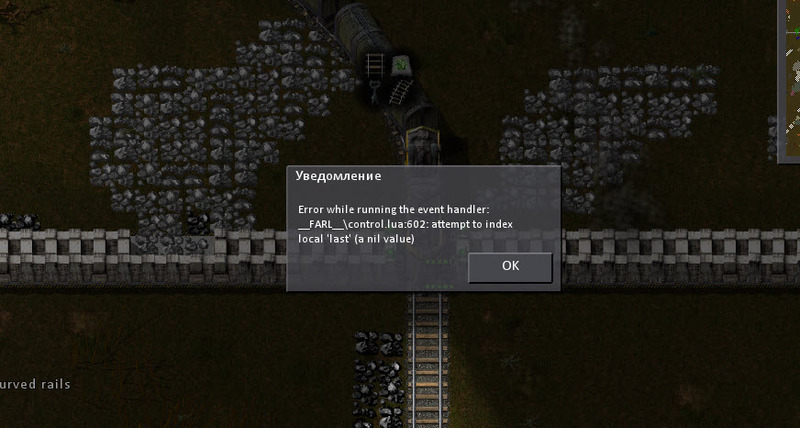 Bug (FARL 0.1.4): I clicked start button while locomotive was slowly moving. Wenihal wrote: Bug (FARL 0.1.4): I clicked start button while locomotive was slowly moving. Will fix it in the next version. You can still start if it is not moving? If you get these kind of errors again: Try pressing Escape, if the window disappears, leave the train and get in again. keke, yeah, it's kinda tricky! 1) why does it only work with big electric poles? it's so sad, i like having lights everywhere and to make it so i need smaller electric poles. Can you please also consider making it possible? maybe it could be done with priorities? like if there are big poles - use big poles. if there are only smaller poles - then use smaller poles? 2) i haven't tested it yet but i know for sure that fart replaces the trees on its way with rail and puts the logs in wagons. that's absolutely awesome! but what does it do if there's a tree or a rock in a place where a new electric pole is supposed to go? does it replace that tree/rock with a new pole? thank you very much! the mod is super-cool! good luck keeping it up! I already played with it a little (added diagonal travel), very nice work! Once i finish reading Amit’s A* Pages (graph theory can really be interesting ) i'll play with it some more. Xyle wrote: 1) why does it only work with big electric poles? it's so sad, i like having lights everywhere and to make it so i need smaller electric poles. Can you please also consider making it possible? maybe it could be done with priorities? like if there are big poles - use big poles. if there are only smaller poles - then use smaller poles? You can still start if it is not moving? When not moving everything works ok.
Choumiko wrote: Will fix it in the next version. Suggestion: connect poles with red/green wires option (with on/off in settings). Wenihal wrote: Suggestion: connect poles with red/green wires option (with on/off in settings). I might add it in, though it starts to feel like there is too much autoplacing going on. On the other hand, connecting wires over hundreds of tiles is as boring as placing tracks. Excellent I like fashion, is another question, he will lay down electric railways? Is the mod translateable? If not, could the author move GUI inscriptions to script-locales? That's damn impressive. It's a worthy successor to the original mod. i dont understand why you'd wanna have red/green wires there. When i suggested to have smaller poles as an option i had to explain myself why i wanted this. That guy here didn't bother to make it clear. Airat9000 wrote: Excellent I like fashion, is another question, he will lay down electric railways? Vitduo wrote: Is the mod translateable? If not, could the author move GUI inscriptions to script-locales? - A drone with a certain range (like the drone in AlphaMod), you start it by placing/using a special item, you then get swiched to the drones view and can move X chunks in any direction, place a (fake) rail and that's the destination for the FARL. It would then calculate the path, the required ressources and start driving once a path is found and it has enough materials. XyLe wrote: i dont understand why you'd wanna have red/green wires there. It's pretty clear to me, he has a mining/factory outpost connected by train to his main base and wants that outpost to work/not work depending on item amounts in his main base. Before starting this mod i wanted something similar (main base only prducing repair packs when different outposts are low on them) and abadoned the idea because of how dull the required work to connect them all was. Have you been placing medium poles yet? It's a bit wastefull since the connection distance is uneven and the logic places them only at the first tile of rails, which leads to an even distance between them. Might be more efficient if i also enable small poles, since they have an even range and are cheaper. Place a station with a single track where you want the automatic track placer to end, name the station as you want it to be, start FARL and select the station by name or from a list, off yer go. Position and orientation comes from the station as they have a direction when tracks are left/right of them.